Website is under construction due to the collapse of Rootsweb.com. Please be patient. Downtown square looking southeast along Franklin St. View is of east/south side of square during election, circa 1915. When you visit Waxahachie and the Ellis County Museum, don’t run off. Enjoy an overnight stay and the charm of this historic town! Follow this link for Waxahachie’s accommodations. The Ellis County Museum, Inc. is a private, non-profit organization dedicated to preserving the history of Ellis County. It was organized in 1968 by local citizens to serve as a repository for materials contributing to the historical interpretation of the county. 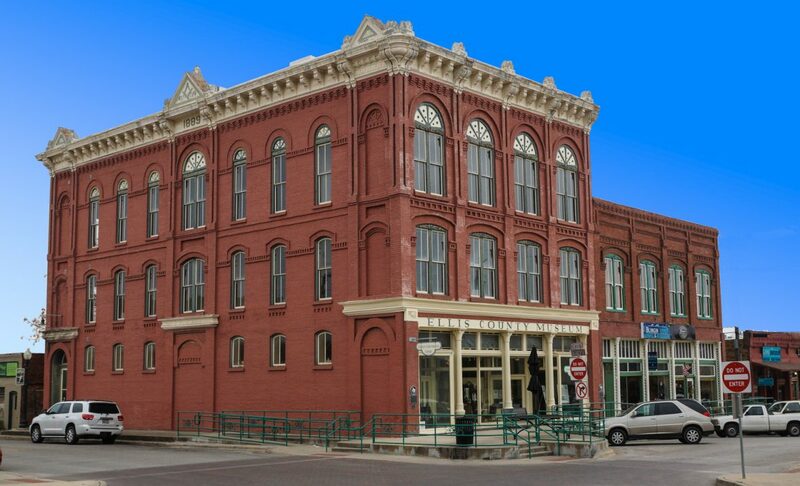 The museum is housed in an 1889 structure located in downtown Waxahachie across the street from the Ellis County Courthouse. Museum hours are: Monday – Saturday, 10 AM – 5 PM. Benefits of membership are: Private previews for new exhibits, invitations to special events and lectures, exhibition announcements mailed to your home, 10% discount on gift shop items, and the general support of local history. Annual dues amounts are: Individual, $15; Family, $25; “Super” Family, $50; Patron, $100; Sponsor, $200; Advocate, $500; Benefactor (lifetime), $1000; Business/Organization, $50 -$100. The purposes of the Ellis County Museum are (1) to collect, preserve, and interpret artifacts and information on the scientific, technological, artistic, social, political, educational, natural, economic, and cultural history of Ellis County; (2) to make Museum holdings and information accessible to the public by means of publication and exhibition; (3) and to engage in and to encourage others to engage in study and educational use of Museum holdings and collections. All information on this website is accurate to the best of our knowledge. We have many contributors of information and can not historically verify all facts. If you find errors or conflicting information, please contact the webmaster so the appropriate changes can be made. Where sources of information are known, credit is given to the individual or group responsible for the research. If we have missed crediting a contributing entity, let us know and we will correct the error.